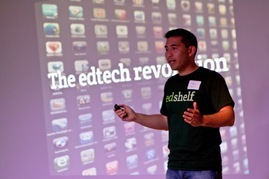 Imagine K12 hosts a Demo Day every year featuring innovative education-focused startups. These events offer an opportunity to learn about the ed-tech market, hear pitches from new companies, and meet the entrepreneurs behind them. If you are an investor interested in the education space, use the form below to inquire about receiving an invitation to our next Demo Day, scheduled for January 2016 in Mountain View. If you are an educator, please consider signing up for Imagine K12's Educator Day mailing list.